1 minute until smooth and pale. Add the parsley, vermouth, garlic and allspice. Season, then beat again until well mixed. 2. 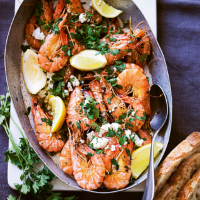 Place the prawns on a baking tray and dot with the flavoured butter. Bake in the oven for 12-15 minutes until thoroughly cooked and pink. 3. Remove from the oven and toss well in the melted butter, then scatter with more parsley leaves and the feta. Serve with lemon wedges to squeeze over and plenty of crusty bread.